We have been seeing more family collections that emerge when people are moving or when clearing a parents home. It is amazing the variety of photos that are in these collections. We had received boxes of albums, framed photos, loose photos, documents, cards, letters and other family history treasures. Families can find this very overwhelming to deal with. 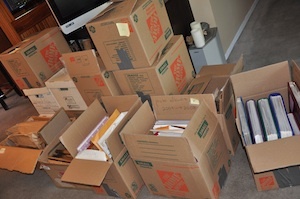 Your collection can be as organized or disorganized when we receive it. It helps if you can identify the years of albums or any kind of order. Sometimes we can figure out dates. What we can do is open separate files on a disc and place each album in its own folder. This way family can identify at least the book the photos belong to. Sometimes we digitize the cover of each album because family usually remember the cover. We also like to give each photo its own unique number so that you will not have several photos with the same number. If we know the year of an album all photos inside might be numbered 1967 – 001-1000 for example. Sometimes we assign a letter like A-100- 1000 etc. The more organized you have your media coming in the more organized it is coming out. We can remove photos from books and return them to the sleeves or place them in photo boxes. Since every estate collection is different, we discuss your finished produce when you bring in your family photos. The Family Estate photo collection in this photo all went on 5 DVD’s.